Today, the FBI’s Uniform Crime Reporting (UCR) Program released Hate Crime Statistics, 2016, its latest annual compilation of bias-motivated incidents reported throughout the U.S. The newest report—which provides information about the offenses, victims, offenders, and locations of hate crimes—reveals that for 2016, law enforcement agencies reported 6,121 criminal incidents that were motivated by bias toward race, ethnicity, ancestry, religion, sexual orientation, disability, gender, or gender identity. 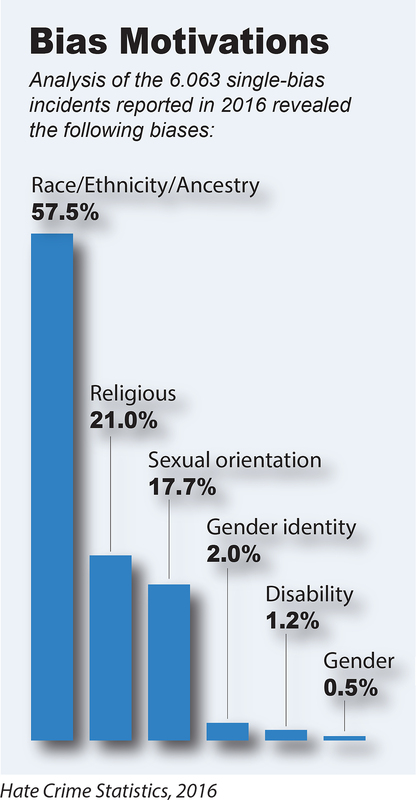 As part of the 2016 report, participants in UCR’s Hate Crime Statistics Program included 15,254 law enforcement agencies. These agencies provided from one to 12 months’ worth of data about bias-motivated crime, and of those agencies, 1,776 reported one or more incidents. The remaining agencies reported no hate crimes occurred within their jurisdictions. The remaining incidents were motivated by a gender identity, disability, or gender bias. Where were these crimes committed? The two largest percentages of hate crime incidents took place in or near residences (27.3 percent) and on or near some type of roadway (18.4 percent). The remaining incidents were perpetrated at a variety of other locations, including schools and houses of worship, commercial and government buildings, restaurants and nightclubs, parking lots and garages, playgrounds and parks, and even medical facilities. In short, hate crimes can and do happen just about anywhere. What about the victims of these crimes? Hate crime victims can be individuals, businesses, government entities, religious organizations, or society as a whole, and they can be committed against persons, property, or society. In 2016, law enforcement reported a total of 7,615 victims of hate crimes. Of the 7,615 overall victims, 4,720 were victims of crimes against persons (both adults and juveniles), 2,813 were victims of crimes against property, and 82 were victims of hate crimes categorized as crimes against society (e.g., weapons violations, drug offenses, gambling). Going forward. The FBI, through its UCR Program, will continue to collect and disseminate information on hate crime—as a means to educate and increase awareness of these types of crimes for the public as well as for law enforcement, government, community leaders, civic organizations, and researchers around the country. The Bureau will also continue to combat hate crimes that fall under federal jurisdiction—the number one investigative priority under our civil rights program—and offer operational assistance to our local and state law enforcement partners during their hate crime investigations. On November 8, 2017—National STEM Day—the FBI hosted a live Twitter chat to answer questions about STEM and the FBI.